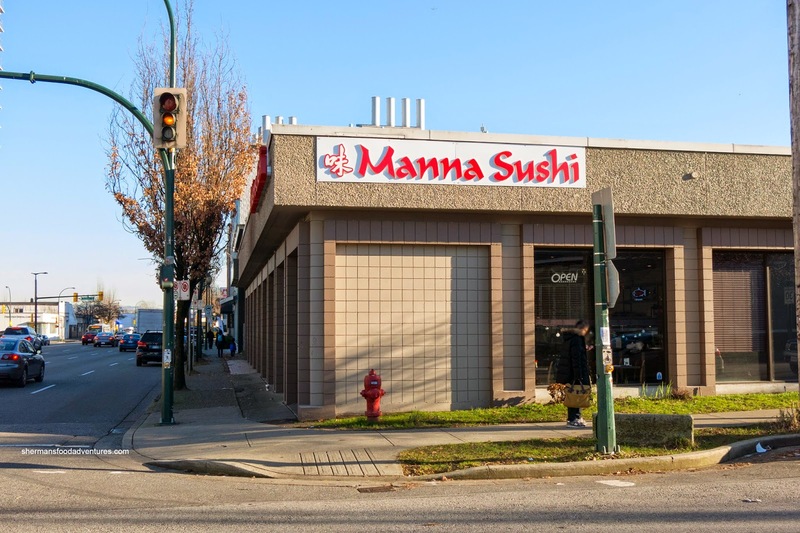 When I first spotted Manna Sushi on 4th at Ontario, I found it an odd location for a Japanese restaurant as it was located within vacated office space in a mainly industrial area. Apparently, I was not paying attention as it is directly across the street from the massive South False Creek developments. Oh yah, maybe they did have a plan as potential clientele are only a flashing light intersection away. On that note, that meant I had to try the place out and it was the perfect solution when the kiddies yelled out the 2 words that made us come to a screeching halt, "I'm hungry"... (well, technically 3 words). We were warmly greeted upon entering the place and promptly seated at a window seat (I was giddy inside). 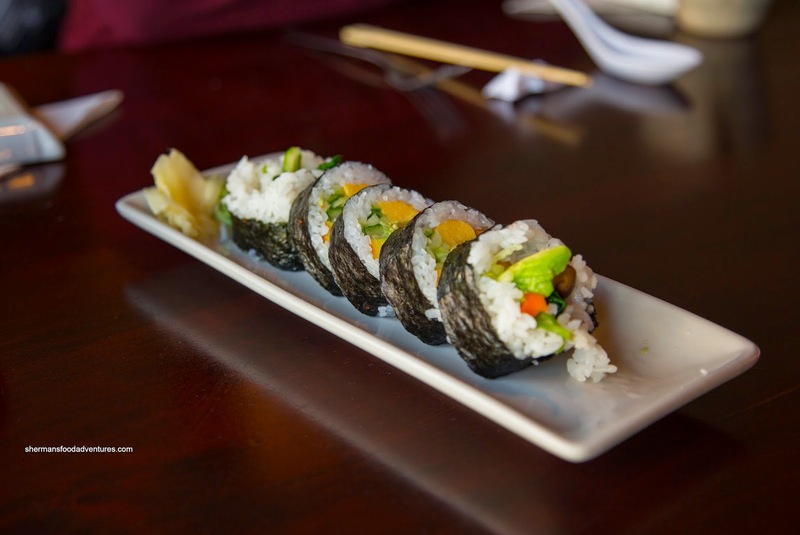 The meal started with a relatively small version of a Futomaki. The first thing I noticed was the somewhat dry rice that was lightly seasoned. If it had a bit more moisture, it would've been on point. Other than that, there was not much to say about it. Next up was the Assorted Sashimi served on a bed of shredded daikon and ice. Although the sashimi was fine, the knife work was a bit sloppy, especially with the slices of tako. I guess the fact it was really chewy affected the cuts as well. 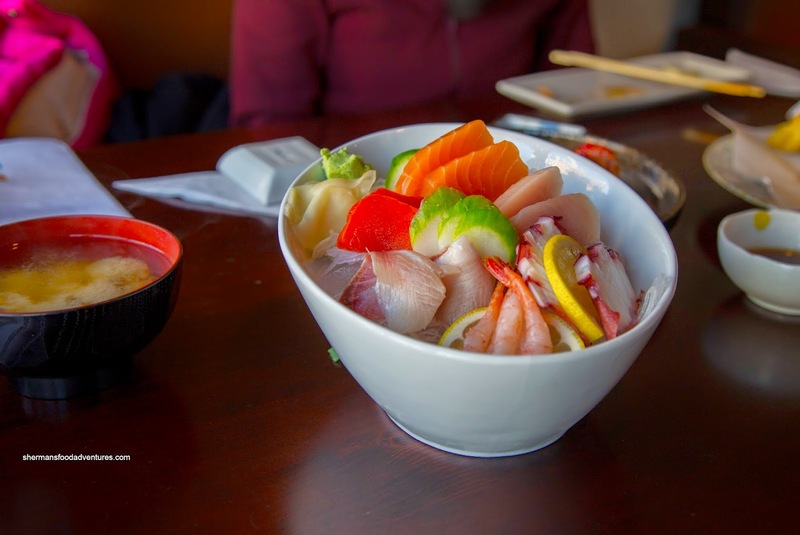 But if one wasn't too fussy about that, it was more than acceptable as a sashimi dish. My daughter dug into it willingly and it gave us hope there was a foodie in the making as my son is the anti-foodie. 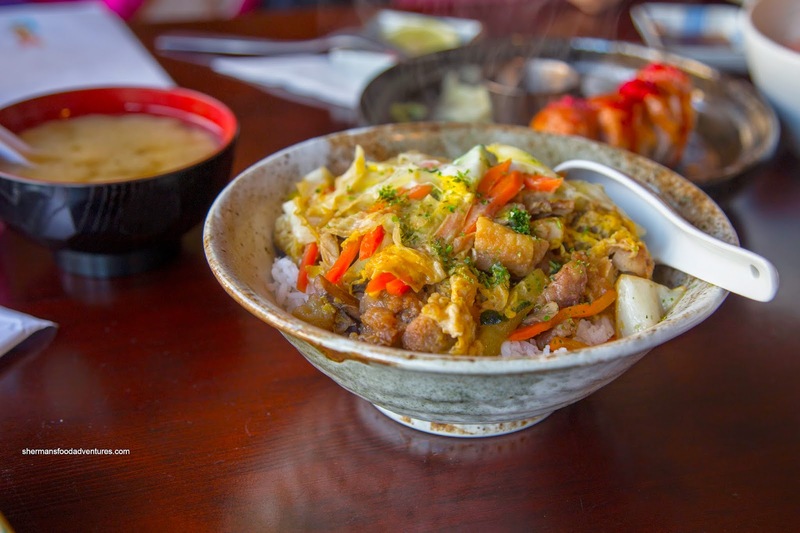 Another dish for the kiddies was the Oyako Don which was very non-traditional version with a tonne of veggies on top. I really didn't mind the veggies, but the pool of water underneath the rice only ensured its mushiness. Flavourwise, I found it somewhat bland due to the water content. As for the chicken, it was plentiful and relatively tender, but hardly moist. 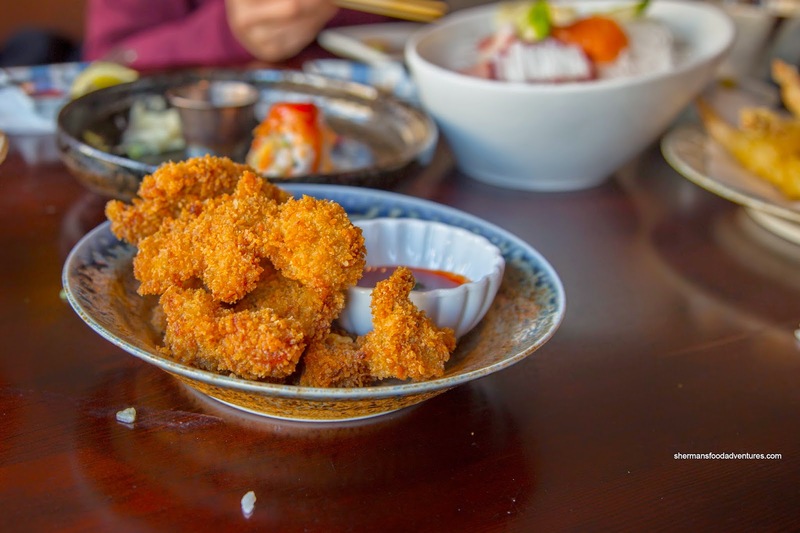 Lastly, we ordered the Chicken Karaage which resembled chicken katsu more than anything else. Disregarding what the dish really was, we didn't mind it. The breading was appealingly crunchy while the brined chicken was succulent and tasty. 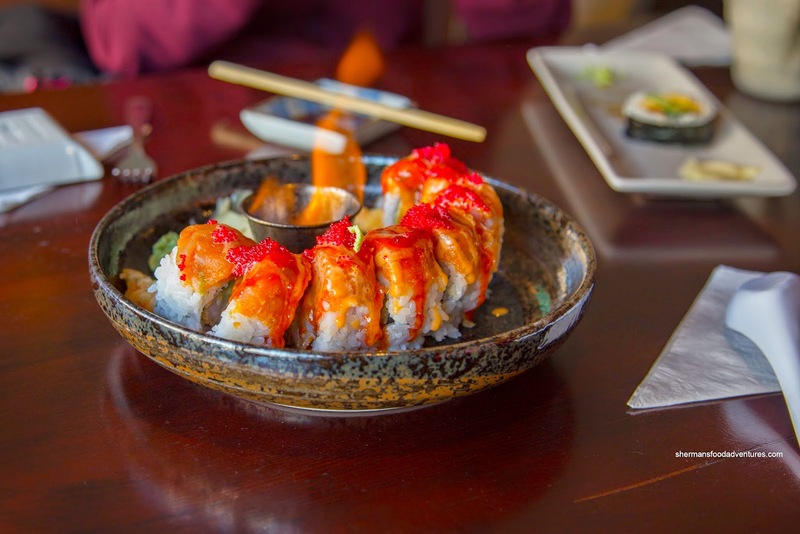 It was served with the same sauce as the Volcano Roll. 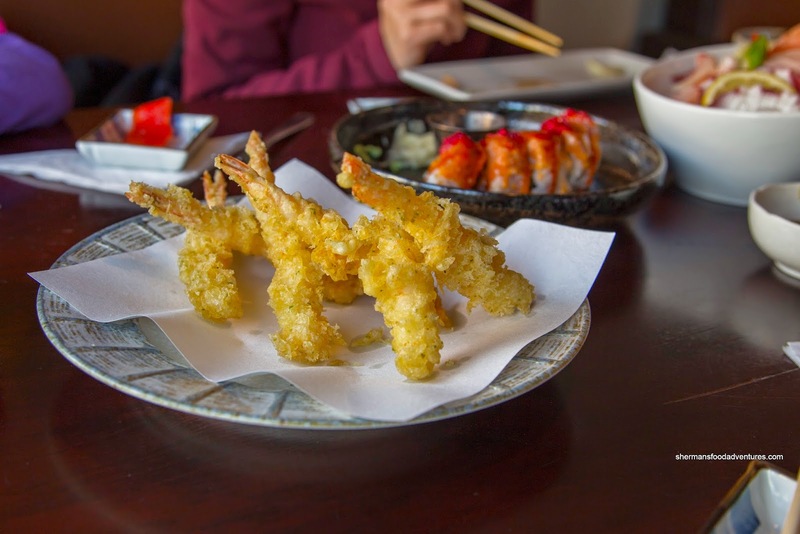 Overall, Manna Sushi slots right into the massive group of middling Japanese restaurants in the GVRD. Almost made it to Manna a few weeks ago with a friend, but they had just closed their lunch service and taking the mid-afternoon break. We ended up going to Nuba. I think Manna will do well with a captive community clientele that is Olympic Village. That area has a dearth of Japanese eats, other than Clubhouse Sushi (which I still prefer) and Yanaki Sushi (6th/Willow).